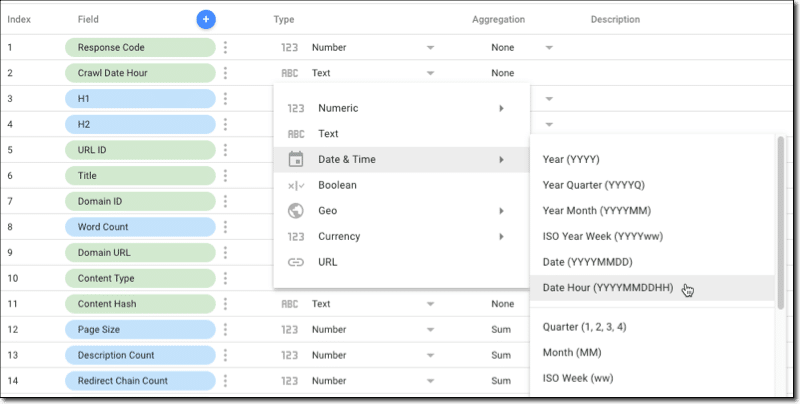 The engineers at Google continue to roll out updates to Data Studio at a relentless and impressive pace. Back in September they released community connectors, which allow you to connect any web service with an API to Data Studio for reporting. Yesterday, they released an update which gives developers much more control over the connector fields in Data Studio, by allowing developers to define Data Types and Semantic Types with more granularity, in your Apps Script code. Additionally, developers can now embed calculated fields into the connector’s schema too, so it’s not left up to the user to figure this out. This is a huge improvement as it obviates the need for the end user to select the correct field settings (for example, which aggregation to use) and should therefore make it easier for users to build accurate reports. Previously, developers only had limited control over the fields defined in the connector Schema. You could set the data type, whether it was a dimension or metric and whether it could be aggregated or not. You couldn’t define what that aggregation was for example, and you were limited to NUMBER, STRING or BOOLEAN as for your data. The Concept Type was DIMENSION, so the field shows up green. The Semantic Type shows up as TEXT, because that’s the default for a STRING Data Type. Inevitably, some users will forget to do this, or not understand how to do this. And that’s why this new update is so important. The description is super helpful when you have a large number of connector fields, so you can give users some guidance. You’re free to put whatever you want in this description (string format only). Read more about Data Types and Semantic Types here. Read more about the different Semantic Types here. Ooh! This is the other exciting update. Calculated Fields open up all sorts of new possibilities in Data Studio, so you can create the custom dimensions and metrics you want. They’re a bit like spreadsheet formulas but they’re tricky to use and the editing window is tiny, so longer formulas are best written out in a text editor first and then copied into Data Studio. Anyway, I digress, but the point is that you, as the developer of the connector, can now define calculated fields in your Schema in advance, thus saving the user the pain of figuring this out. Read more about defining calculated fields in the Schema here. With Calculated Fields, do you know of a way to calculate a median from a set of filtered results in Google Data Studio? I’d like to display a median result from filtered set of data from our gross_sales column. I am using =median(my_column_Name_which_is_a_number_currency) , but the reject message notes could not parse formula. Btw, your course Google Sheets and Data Studio Course has been super helpful! !